I spent the past week formatting the Flashdogs ebook. 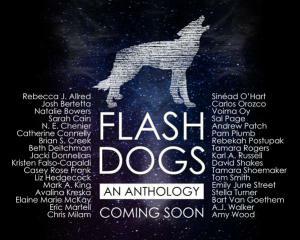 The alpha dogs at FDHQ just sent out this teaser image by Tam Rogers and Carlos Orozco, which lists all the authors–thirty-four of them!–who have stories in the anthology. I got to read the entire book early as I proofed it, and I’m happy to say it reads really well. All the stories were a great, diverse lot, stretching from the nearly literary to the fully comedic. I can’t wait to see the final version coming soon in December. Next PostNext The Flashdogs are here!